The hotel boasts a proud heritage and some spectacular backdrops for wedding magical photos. Convenientally located one hour from Galway/Sligo and 90 minutes drive from Dublin, the Abbey is a most accessible wedding venue owing to it’s geographical location and excellent bus and rail links to all major towns and cities. The hotel has been run the Grealy family dynasty for over four generations and the Abbey's historical links date back for many centuries. Roscommon Dominican Abbey was founded over 750 years ago by High King Fedlimid Ó Conchobair. 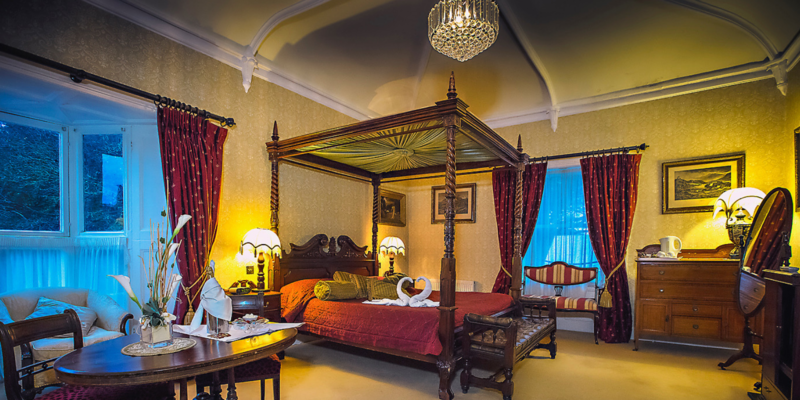 The theme of old world romance continues inside the hotel, with authentic finishing touches from stunning antiquities and paintings to the intricately carved four poster bed and roll top Victorian bath in the bridal suite. Guests can also enjoy the modern conveniences of the Multi -Award Winning leisure centre, Abbey Health and Fitness, recent winner of the coveted NSAI Diamond White Flag Award - the highest award achievable for hotels in the hospitality sector. With wedding packages tailored from 50 guests to 350 guests, the 4* Abbey Hotel is the ideal central location for every wedding from intimate civil ceremonies in the luxurious Fortfield Suite to lavish big days in our spectacular refurbished ballroom or romantic outdoor ceremonies on our grounds. Come along and view our Fortfield Suite for your Civil Ceremony. Enquiries to weddings@abbeyhotel.ie or download a brochure from our site.